Welcome to the final day in our Lenten series "40 Days for Vocations." It's Holy Saturday, and tonight we celebrate the great Paschal Vigil. We've made it to the final day of our 40 days for vocations. Have you seen this icon before? We have a variation of this icon hanging on the icon wall in our living room. I absolutely love it. A college professor of mine first introduced it to me, and - I can't remember his exact words - he pointed out how Jesus was a total muscle man (my words) in this icon. Like, he's simultaneously lifting Adam and Eve out of the grave! That's what's happening here. I love the ancient homily on Holy Saturday. Have you read it or heard it before? We always think of Holy Saturday being a quiet day of waiting...but so much was happening that day! 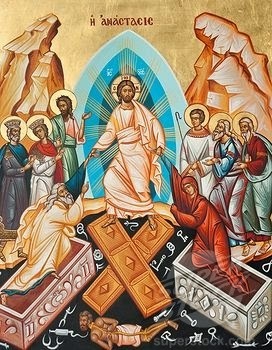 Christ descended down to the dead to free those faithful ones waiting, and to open the gates of heaven for them. First among them, was Adam and Eve. ‘I am your God, who for your sake became your son, who for you and your descendants now speak and command with authority those in prison: Come forth, and those in darkness: Have light, and those who sleep: Rise." Today, this very night, Christ opened the gates of heaven. Man's true vocation is to be in union with God - in heaven - forever. After the Fall, that vocation wasn't possible anymore, because of sin. But now - with the death and resurrection of Christ - it is made a possibility again. Christ restored man to his original vocation. "O Happy Fault! O Necessary Sin of Adam! That won for us so great a redeemer!" I love the Exsultet, the beautiful chant sung at the beginning of the Paschal Vigil this night. It is a reminder that, when we celebrate the great Paschal Feast, we recall the night that everything changed. Because of this night, we can now be in heaven one day. We can be with God, forever. It's important to discern our individual vocations. It's important to live out those individual vocations. But we can't lose sight of why God gives us those vocations. Our vocation is our path to heaven. Our vocation is the way in which Christ takes us by the hand and leads us to Himself. I hope and pray these 40 days (of Lent and for vocations) has been a blessing for you! Happy Easter! Thank you for writing this series. You must have put a lot of prayer into it, as well as effort. I hope many people found a lot to contemplate and were helped in their discernment!